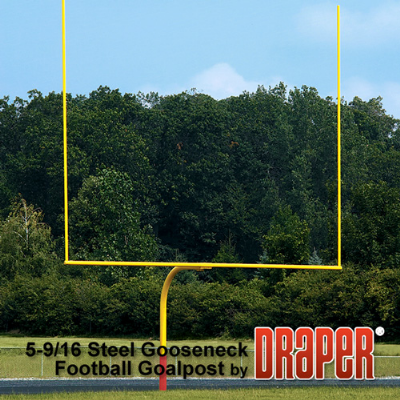 Permanent/semi-permanent installation 5-9/16" (141 mm) steel gooseneck goalpost. Goalpost is yellow powder coated collegiate version with 18' 6" (572cm) between 20' (610cm) uprights and 96" (244 cm) setback for maximum player safety. Extension allows the use of many standard soccer goals beneath crossbar. Install by direct bury permanent installation design with 48" (123 cm) in ground, or semi-permanent installation utilizing optional 505101 ground sleeve. Features 4-1/2" (114 mm) OD steel cross tube and 20" (51 cm) high 2-3/8" (60 mm) diameter uprights. Includes all necessary zinc plated minimum grade 5 hardware.